East Fife Ladies wrapped up the league title on Sunday.. The champagne corks were popping across King George V Park at the weekend as East Fife Ladies became SWFL North First Division winners. They had to come from behind to seal the win on their home turf against a Dunfermline side who also had something to play for, knowing a point for them would ensure second place. East Fife also needed just the solitary point, but there was no hint of both sides settling for what they needed and playing out a draw. In rather bizarre circumstances it was Dunfermline who went ahead on five minutes. 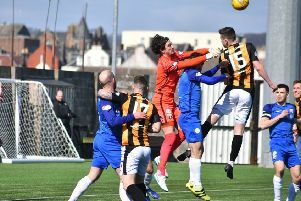 A corner was floated in and curled well out of play as Fife goalie Keir was man handled to the ground. With Anderson expecting the bye kick or foul to be awarded, with both being so obvious, the ball bounced off her and in to the back of the net. Despite protestations from players and spectators the goal was given. Fife responded well anda Graham corner was swung in to the front post. The faintest touch from Skivington at the front post found Anderson in the middle of goal and she thumped home the equaliser. Skivington sent the home side into the half-time break ahead from the penalty spot. After good work in defence Keir found Skivington with a long pass. With the pass beating the Pars back line Skivington looked second best to reach the pass ahead of the goalkeeper but did and having taken the shot early rolled the ball beyond the keeper and in to the net. The final Fife goal came from Guppy who drilled a low left foot shot in at the near post on 70 minutes. Dunfermline refused to give up and pulled another back late on to end the scoring 4-2 in East Fife’s favour. This weekend East Fife are away to Forfar.